MIAMI, FL -- (MARKET WIRE) -- May 3, 2007 -- Mercy Hospital will debut a technique for total hip replacement, also called arthroplasty, via a small incision procedure during a live web broadcast on www.OR-Live.com, May 3rd at 5:00 PM EDT in English and Spanish. Carlos Lavernia, MD, medical director of the Orthopaedic Institute at Mercy Hospital, will perform the surgery. Total hip arthroplasty reforms the hip joint and, in turn, leads to a better quality of life. Due to disease processes or, in some cases, repetitive trauma, the weight-bearing surfaces of the hip joint become worn away. The result is significant pain and disability, sometimes at an early age -- joint replacement is then required and has proven to be the most effective treatment option. 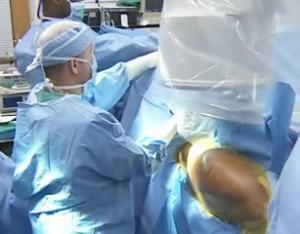 New technology, new techniques and new types of hip replacements have made this procedure easier to recover from and more accessible to patients of all ages. Additionally, due to the less invasive nature of the procedure, patients may experience reduced trauma to the surrounding tissue, faster recovery times and increased longevity of their implants. "The way hip replacements are being done now is beyond exciting," said Dr. Lavernia. "The new methodology provides better outcomes and faster recovery. Often, the patient feels so good so soon, we have to urge them to not engage in activities too quickly." In addition to the live hip replacement, footage of an Arthroscopic Hip Femoroacetabular Impingement (FAI) resection will be integrated into the webcast. This procedure will be performed by Mercy Hospital orthopaedic surgeon J. Pieter Hommen, MD. Often inflicting individuals in their forties with early hip pain, the labrum and cartilage may become destroyed as the femur and pelvis bones pinch together. Otherwise known as hip impingement, this form of hip pain is increasingly being recognized as a cause of hip osteoarthritis. Arthroscopy of the hip is a mainstream surgical procedure with well-defined indications and expected outcomes, primarily because of recent advances in surgical instrumentation and techniques. Live surgery webcasts give patients and family members the opportunity to observe the surgical techniques they themselves may need one day. This may minimize the fear and anxiety associated with surgery. Dr. Lavernia, a Voluntary professor of orthopaedics at the University of Miami and Biomedical and Mechanical Engineering at Florida International University, has also served as principal investigator of several research studies. Some of his research findings demonstrate that fear and anxiety play a significant role in delaying joint replacement surgery and that waiting too long to undergo this type of surgery negatively affects recovery and prevents proper healing. The study also showed that women and minorities -- particularly African-Americans -- have an increased tendency to delay surgery. Nationally recognized for his advancements in technology and his ongoing commitment to providing the highest quality in patient care, Dr. Carlos Lavernia was recently honored by being selected as one of the prestigious Best Doctors in America in 2006. The Orthopaedic Institute at Mercy Hospital specializes in providing the most advanced surgical techniques for joint replacements, hip and knee surgeries and arthroscopies available today. The award-winning Institute also conducts extensive research in the orthopaedic field. Mercy Hospital, a recipient of the prestigious Magnet™ award for nursing excellence, is Miami-Dade's only Catholic Hospital. Established in 1950, it is sponsored by the Sisters of St. Joseph and a member of Catholic Health East. A 483-bed acute care hospital, staffed by over 700 physicians representing 27 medical specialties, its Centers of Excellence include: The Heart Center at Mercy Hospital, the Miami Cancer Center at Mercy Hospital, the Orthopaedic Institute at Mercy Hospital, and the Minimally Invasive Surgical Institute at Mercy Hospital. Mercy Hospital is located at 3663 S. Miami Avenue, Miami, FL. "The new methodology provides better outcomes and faster<br> recovery. Often, the patient feels so good so soon, we<br> have to urge them to not engage in activities too quickly."